Ferrets are commonly kept as pets and are a domesticated form of the European polecat, they're mammals, closely related to weasels. 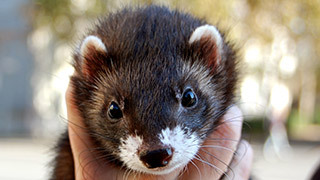 Ferrets are carnivores, just like their ancestors. In some regions of the world it's forbidden to keep ferrets as pets as they can become a pest and a danger to native fauna when they escape or are set free.